Move over, Paula Deen! Generations before the Food Network, the leading lady of Southern cookery was Mary Randolph. 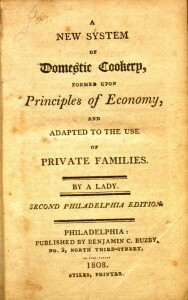 Her book, The Virginia Housewife, is considered the first American regional cookbook. The Virginia Housewife was very influential, with multiple editions printed during the first half of the nineteenth century. Make the forcemeat thus: take the crumb of a loaf of bread, a quarter of a pound of beef suet shred fine, a little sausage meat or veal scraped and pounded very fine, nutmeg, pepper, and salt to your taste; mix it lightly with three eggs, stuff the craw with it, spit it, and lay it down a good distance from the fire, which should be clear and brisk; dust and baste it several times with cold lard; it makes the froth stronger than basting it with the hot out of the dripping pan, and makes the turkey rise better; when it is enough, froth it up as before, dish it, and pour on the same gravy as for the boiled turkey, or bread sauce; garnish with lemon and pickles, and serve it up; if it be of a middle size, it will require one hour and a quarter to roast. If you missed Food Revolutions, our exhibition of food- and diet-related publications last spring, you can now view it online! This exhibition examines our changing notions of healthy eating over two centuries. The digital version of the exhibit features a video of Dr. Ingolf Gruen’s opening talk, as well as images and links to full text for many of the books we featured in the Ellis Library Colonnade. Food Revolutions was an event affiliated with Food Sense: The 8th Annual Life Sciences and Society Symposium. Don't miss the Food Sense symposium this weekend! This is our last Friday Food post. Eliza Leslie (1787–1858) aspired to be a poet or novelist, but she is best remembered today for her cookbooks. 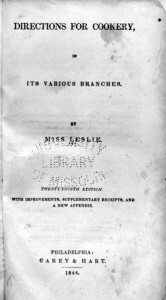 In 1828, Leslie published her first book, Seventy-Five Receipts for Pastry, Cakes and Sweetmeats, a collection of recipes she had developed as a cooking school student. Encouraged by its popularity, she went on to publish at least six more titles and established a reputation as the most popular and influential food writer in America. 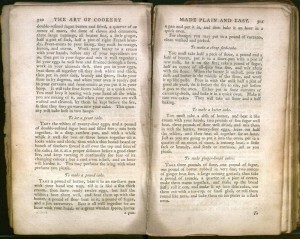 Directions for Cookery (1837) is considered her most important work. Leslie was famous for popularizing distinctly American foods, as the following recipe from Directions for Cookery shows. 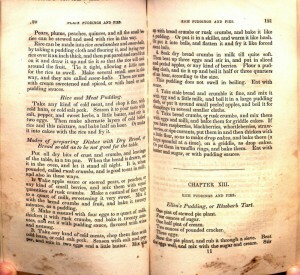 Her Indian Meal Book (1846) was the first cookbook devoted entirely to corn. Take twelve ears of green corn, as it is called, (that is, Indian corn when full grown, but before it begins to harden and turn yellow,) and grate it. Have ready a quart of rich milk, and stir into it by degrees a quarter of a pound of fresh butter, and a quarter of a pound of sugar. Beat four eggs till quite light; and then stir them into the milk, &c. alternately with the grated corn, a little of each at a time. Put the mixture into a large buttered dish, and bake it four hours. It may be eaten either warm or cold, for sauce, beat together butter and white sugar in equal proportions, mixed with grated nutmeg. To make this pudding,—you may, if more convenient, boil the corn and cut it from the cob; but let it get quite cold before you stir it into the milk. If the corn has been previously boiled, the pudding will require but two hours to bake. Maria Eliza Rundell (1745–1828) didn’t set out to be a domestic goddess. The widow of a surgeon, she collected recipes and household hints for her three married daughters. John Murray, a prominent publisher, happened to be a family friend, and Rundell gave him her recipe collection as a favor, expecting no financial reimbursement. Murray published Rundell’s work in 1806 as A New System of Domestic Cookery, and Rundell became a housekeeping superstar, supplanted only by Mrs. Beeton in the 1860s. The book was an immediate success, especially in the United States, and went through over 65 editions in the next thirty years. Rundell focused on budget cooking and household management. Her recipes included dishes such as eel pie and calves’ foot broth, as well as more standard fare. This week’s recipe is an early example of Anglo-Indian cuisine, fostered by British contact with India through colonization and trade. Cut up the chickens before they are dressed, and fry them in butter, with sliced onions, till of a fine colour : or if you use those that have been dressed, do not fry them : lay the joints, cut in two or three pieces each into a stewpan, with veal or mutton gravy, a clove or two of garlick, four large spoonfuls of cream, and some Cayenne : rub smooth one or two spoonfuls of curry powder, with a little flour, and a bit of butter, and add twenty minutes before you serve ; stewing it on till ready. A little juice of lemon should be squeezed in when serving. Slices of rare done veal, rabbit or turkey, make a good curry. A dish of rice boiled plain, as hereafter directed, must be always served to eat with curry. Don’t miss Food Sense, the 2012 Life Sciences and Society Symposium, March 16-18. SCARaB is participating with an exhibition of books on science and nutrition, now open in the Ellis Library Colonnade. William Kitchiner claimed to have a medical degree, but there is no evidence of his ever actually attending university. His eccentric, epicurean dinner parties are his primary claim to fame. He also invented a condiment he called Wow Wow Sauce, which became popular in the nineteenth century. Kitchiner takes scientist’s approach to cooking in The Cook’s Oracle. 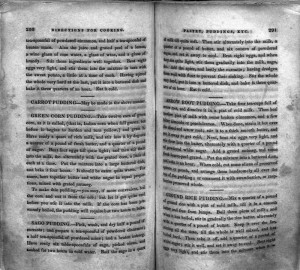 He published specific instructions for cooking techniques, an explanation of the chemical processes of cooking, and a table of weights and measures. Chop some Parsley leaves very finely, quarter two or three pickled Cucumbers, or Walnuts, and divide them into small squares, and set them by ready; — put into a saucepan a bit of Butter as big as an egg; when it is melted, stir to it a tablespoonful of fine Flour, and about half a pint of the Broth in which the Beef was boiled ; add a tablespoonful of Vinegar, the like quantity of Mushroom Catsup, or Port Wine, or both, and a teaspoonful of made Mustard; let it simmer together till it is as thick as you wish it, put in the Parsley and Pickles to get warm, and pour it over the Beef, — or rather send it up in a Sauce-tureen. Obs.—If you think the above not sufficiently piquante, add to it some Capers, or a minced Shallot, or one or two teaspoonsful of Shallot Wine (No. 402), — or Essence of Anchovy, — or Basil (No 397), — Elder, or Tarragon (No. 396), or Horseradish (No. 399), or Burnet Vinegar ; or strew over the meat, Carrots and Turnips cut into dice, — minced Capers, — Walnuts, — Red Cabbage, — pickled Cucumbers, — or French Beans, &c.
Don’t miss Food Sense, the 2012 Life Sciences and Society Symposium, March 16-18. SCARaB will be participating with an exhibition of books on science and nutrition. Catharine Beecher (1800-1878), the sister of the abolitionist Harriet Beecher Stowe, was an early feminist and advocate of women’s education. Beecher was at the forefront of the home economics movement in the nineteenth century. She sought to increase the status of traditional women’s work such as cooking and childcare, arguing for its value to society and the need for female education to inform this work. Beecher published her Treatise on Domestic Economy in 1841. 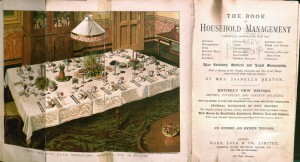 The book combined useful household hints with Beecher’s radical views on women’s rights and education. Surprisingly, the book was a great success; fifteen editions were published in the next fifteen years. 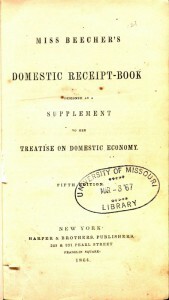 As supplements to the Treatise, Beecher published several other cooking and household management books, including Miss Beecher’s Domestic Receipt Book. One pint of stewed pie plant. One half pint of cream. Two ounces of pounded cracker. Stew the pie plant, and rub it through a sieve. Beat the eggs well, and mix with the sugar and cream. Stir the cracker crumbs into the fruit, and add the other ingredients. Line your plate with a moderately rich paste, and bake half an hour. As the oldest girl in a family of twenty-one children, Isabella Mayson (1836–1865) had ample practice in the domestic arts by the time she married Samuel Beeton at the age of 20. Samuel was an innovative editor and publisher, and Isabella participated fully in his publishing business, putting her domestic skills to work as editor of the English Woman's Domestic Magazine. The year after her marriage, Isabella also began work on the monumental compendium of domestic science that is The Book of Household Management. The book was first published it in 1861, when Isabella was only 25, and it was an immediate success due to her attention to accuracy, economy, and taste. Isabella died of childbed fever only a few years later, at the age of 28. After her death, Samuel sold the rights to her book to the publisher Ward, Lock, and Tyler, whose intense marketing created the Victorian domestic icon that Mrs. Beeton later became. Ingredients.—About 2 lbs. of cold roast beef, 2 small onions, 1 large carrot or two small ones, 1 turnip, a small bunch of savoury herbs, salt and pepper to taste, 4 tablespoonfuls of gravy, 3 tablespoonfuls of ale, crust or mashed potatoes. Mode.— Cut the beef in slices, allowing a small amount of fat to each slice; place a layer of this in the bottom of a pie-dish, with a portion of the onions, carrots, and turnips, which must be sliced; mince the herbs, strew them over the meat, and season with pepper and salt. Then put another layer of meat, vegetables, and seasoning; and proceed in this manner until all the ingredients are used. Pour in the gravy and ale (water may be substituted for the former, but it is not so nice), cover with a crust or mashed potatoes, and bake for ½ hour, or rather longer. Time.—Rather more than ½ hour. Average cost, exclusive of the meat, 6d. Note.—It is as well to parboil the carrots and turnips before adding them to the meat, and to use some of the liquor in which they were boiled as a substitute for gravy ; that is to say, when there is no gravy at hand. Be particular to cut the onions in very thin slices. Don't miss Food Sense, the 2012 Life Sciences and Society Symposium, March 16-18. SCARaB will be participating with an exhibition of books on science and nutrition. In March,Special Collections, Archives and Rare Books will be participating in Food Sense, the 2012 Life Sciences and Society Symposium, with an exhibition of books on science and nutrition. 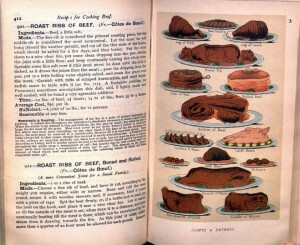 We also maintain a collection of rare and historic cookbooks dating from the seventeenth through the twentieth century. To highlight these rich holdings, we’ll be sharing a recipe each week through March 16, the symposium weekend. This week’s feature is Hannah Glasse. Born in 1708, Glasse eloped at age 16. By the time she was 40, she found herself living in not-so-genteel poverty as a widow with ten children. 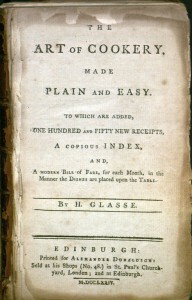 Glasse turned to writing cookbooks to support her family, publishing The Art of Cookery in 1747. Although The Art of Cookery was very successful, Glasse still ended up in debtor’s prison. To add insult to injury, the public didn’t think that such a successful cookbook could have been written by a woman. 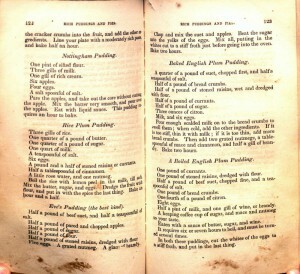 The cookbook was thought to have been written by Dr. John Hill, using Hannah Glasse as a penname, until the 1930s. Take a pound of butter, beat it in an earthen pan with your hand one way, till it is like a fine thick cream, then have ready twelve eggs, but half the whites; beat them well, and beat them up with the butter, a pound of flour beat in it, a pound of sugar, and a few carraways. Beat it all well together for an hour with your hand, or a great wooden spoon, butter a pan and put it in, and then bake it an hour in a quick oven. For change, you may put in a pound of currants, clean washed and picked.